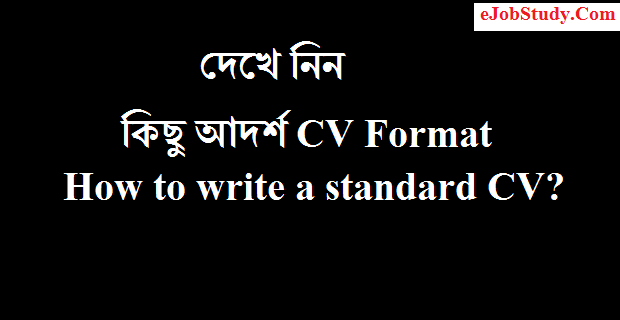 Standard CV Format For Bangladesh pdf. Today i will give you some best sample of cv format for govt job, bank job and others job in Bangladesh. Data Job Resume Format And More Cv Format Template Available cv format bdjobs career Cv Format For Bangladesh bdjobs career essential job site in Bangladesh Bd jobs career is the leading career management site in Bangladesh. 2006-2007 : Customer service in Tate Modern (British Art Gallery). Hobbies : Swimming, Reading, Traveling & Cricket. To obtained a standard job in any well-known organization where I can apply my creative skills and competency. COMPUTER LITERACY Major courses on computer completed Successfully completed the course on “Certificate in Computer Application” from BCC (Bangladesh Computer Council). VALUE OFFERED Having six years (1999-2005) cultural experience as an organizer in a leading cultural group of R.U. named “Bangladesh Gonoshipli Shangstha”, Rajshahi University Branch. P.S. : Rajbari Sadar, Dist. Rajbari. COMPUTER LITERACY Major courses on computer completed Operating Systems: Windows-98, Applications: MS Word, MS Excel, Power Point and Internet Basics. Excellent communication skills in English and Bangla both written and verbal. Supervised by- Apurba Kumar Roy, Assistant Professor, Department of Genetics and Breeding, University of Rajshahi. VALUE OFFERED I am a debater of debate team of Genetics and Breeding Department as well as a debater of Shahid Ziaur Rahman Hall Debate team of Rajshahi University. Having six years (1999-2005) cultural experience as an organizer (cultural secretary and assistant general secretary) in a leading cultural group of R.U. named “Bangladesh Gonoshipli Shangstha”, Rajshahi University Branch. I have completed a cultural workshop organized by Rajshahi University Shanscritic Jote. I have worked as cultural secretary in two sessions and journal secretary in one session of Genetics and Breeding Sumity, Rajshahi University. Looking for hard and Challenging Job where I will have the scope to utilize my potentiality, adaptability and skill to do something innovate and from where I will be able to enhance my knowledge. Operating System : Windows 98, XP and Seven. Application Package : MS. Word, MS. Excel & MS. PowerPoint. Graphics Design : Adobe Illustrator, Adobe Photoshop. Hardware : Computer Hardware Setup & Setting, Windows trouble shooting. To build up career as an Executive in the Pharmaceutical Industries either in the national or in the multinational company, I would like to implement my knowledge, creativity and innovative thinking in this field. Passing Year : 2010, held on 2011. Passing Year : 2009, held on 2010. A four weeks in-plant training in “Opsonin Pharma Limited”. December, 2010: Active performer in scientific exhibition arranged by Pharmacy Department during Golden Jubilee of Rajshahi University. My Aim is to face all the challenges with realistic professional spirit and make the career brilliant one. The professional may be belongs to any profession. Pro-active and oriented with diverse background in computer and communication. Strong team builder and facilitator, whose hands-on approach, personal integrating and reliable, consistently foster an atmosphere of credible relationship with the stakeholder. Team spirit: Team Player, Work well under pressure and exhibits excellent communication skills, Understanding of Group Dynamics etc. Well conversant and fluent in writing and oral communication in English & Bengali.